New Rochelle, NY, August 21, 2018–Recent findings from formative research conducted with rural, non-Hispanic White males aged 12-17 years informed the development of health messaging for the U.S. Food and Drug Administration's (FDA's) first nationwide smokeless tobacco (SLT) public education campaign. The youth were receptive to messaging that conveyed authenticity and contained straightforward facts about the health consequences of SLT use. Messages which portrayed the progression from familiar short-term health effects to more serious long-term consequences of SLT use, also resonated with the youth. The findings are described in detail in an article published in Health Equity, a peer-reviewed open access journal from Mary Ann Liebert, Inc., publishers. Click here to read the full-text article free on the Health Equity website. The study included rural, white male youth at risk for initiating or already experimenting with SLT as they are affected disproportionately by SLT use and reflect the target audience of the FDA's campaign. SLT had strong cultural significance and was perceived as safe among these youth. In the article, entitled " Developing Smokeless Tobacco Prevention Messaging for At-Risk Youth: Early Lessons from "The Real Cost" Smokeless Campaign," the researchers suggest that the findings could be leveraged in the development of other educational materials and messages to address SLT use among rural at-risk youth. Matthew Walker, DrPH and colleagues from the FDA (Silver Spring, MD), Squared Research (Fairfax, VA), Massachusetts Institute of Technology (Cambridge, MA), and Battelle (Washington, DC) coauthored the article. "Optimally in addressing health disparities, we strive to improve quality and quantity of years of life. The rise in mortality rates of rural, non-Hispanic white men has been influenced by the opiate epidemic but is also influenced by cancer rates. Effective outreach that resonates with rural youth can help in efforts to mitigate this." states Health Equity Editor-in-Chief Ana E. Núñez, MD, Associate Dean for Diversity, Equity and Inclusion and Professor of Medicine, Drexel University School of Medicine, Philadelphia, PA.
Health Equity is the new peer-reviewed open access journal that meets the urgent need for authoritative information about health disparities and health equity among vulnerable populations. With coverage ranging from translational research to prevention, diagnosis, treatment, and management of disease and illness, the Journal serves as a primary resource for organizations and individuals who serve these populations at the community, state, regional, tribal, and national levels. Health Equity is supported by generous grants from the W.K. Kellogg Foundation and the Robert Wood Johnson Foundation to ensure that it is accessible as widely as possible and to provide a framework for achieving health equity for children, families, and communities by reducing and ultimately eliminating disparities in health and their social, economic, and environmental determinants. 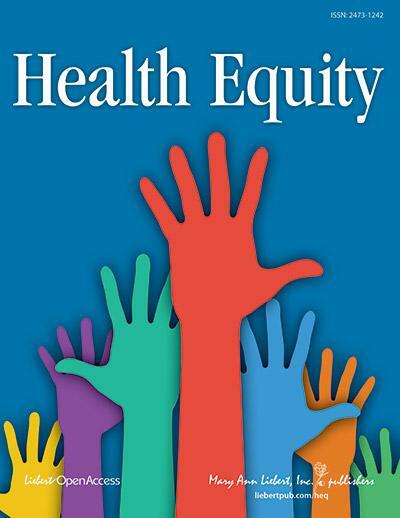 Complete information is available on the Health Equity website.